A new White House policy would make factory farming even faster — and more dangerous. They just announced plans to increase chicken slaughter line speeds to an unimaginable 175 birds per minute, up from the old limit of 140 birds per minute. This will certainly result in the cruel and unjust treatment of animals and factory farm workers. Chickens are supposed to be stunned before being killed quickly by an automated blade. Further down the line, a worker with a knife is put in place to catch the ones who might miss the stunning. But with line speeds this fast, and workers forced into a more stressful environment, more birds will inevitably miss this crucial step meant to limit their suffering. They could end up being scalded alive. The increased speeds will also put workers' safety in jeopardy as they struggle to keep up with the frenetic pace of the slaughter line. Already, the rate of injury for factory farm workers in the US is six times greater than anywhere else in the world. And with 2.5 billion pounds of excess meat currently sitting in cold storage, the last thing our food system needs is faster factory farming. It's bad for animals, for consumers, for farm workers, and for the planet. Compassion is working hard to convince food businesses to do better for chickens—but we need your voice to be successful. Join us in standing up for chickens and factory farm employees by telling the White House to reconsider their slaughter line speed rules. Sign our petition now to stop the increase in slaughter line speeds! As an animal lover, I am writing to voice my strong disapproval of the recent administration decision to speed up poultry slaughter line processes from 140 to 175 birds per minute. Increasing slaughter line speeds to this unreasonable level will result in even greater animal suffering — as more and more birds will miss crucial steps in the slaughter process — and increase the frequency of injury to farm workers. Already, poultry slaughter workers in the United States face injury rates six times higher than any other U.S. industry. This increase in speed also puts consumer safety at even greater risk, as there will be less time for workers to conduct thorough checks for signs of disease and contamination. With surplus meat stockpiles larger than ever before — and growing — the last thing our food system needs is even faster factory farming. 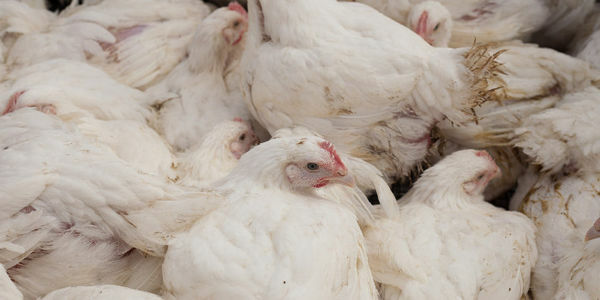 Increasing poultry slaughter speeds is cruel to animals, dangerous for farm workers and consumers — and considering that the meat industry will soon outpace the oil industry as a leading contributor to greenhouse gas emissions and climate change, it's bad for the planet, as well. I urge you to put animal welfare, worker and consumer safety, and environmental protection first and reconsider this reckless policy.